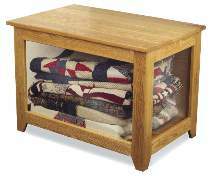 This chest has unbreakable clear plastic on three sides so your prized quilts can be seen and enjoyed by everyone. Generous size holds several quilts. Sturdy construction allows chest to be used for extra seating. Measures approx. 21”H x 29”W x 19”D. Order hardware and clear plastic for sides separately below. Quilt Display Chest Hardware Includes a pair of non-mortise hinges, a pair of lid supports and 40 turn buttons. Project plan, clear plastic, wood and wood finish are not included. Clear Plastic for Quilt Display Chest Includes enough .125” thick acrylic plastic for front and both sides of chest. Plastic is cut slightly oversize so builder can trim for a perfect fit.